Betting on licensed brands for mobile games is a huge risk, but the rewards could also be huge. [7%] and [9%] of our total revenue for the three and twelve months ended December 31, 2012, respectively and 11% and 12% of our total revenue for the three and twelve months ended December 31, 2011, respectively, came from a single customer, Zynga. Revenue from Zynga consisted of payments processing fees related to their sale of virtual goods and from direct advertising purchased by Zynga. 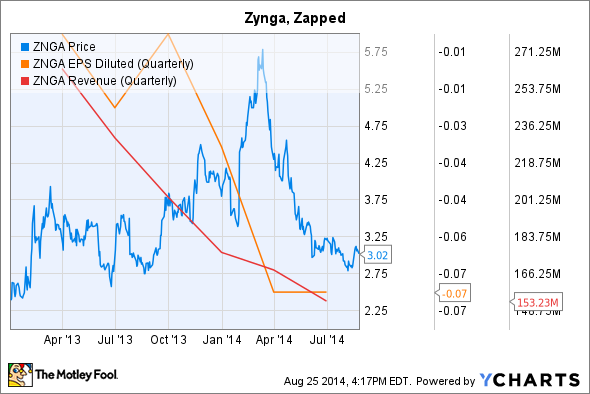 Zynga has struggled to produce meaningful revenue and earnings growth since, hurting stock returns. For CEO Don Mattrick, it's a complicated problem that won't be easy to fix. His strategy? Employ big brands to create the next Candy Crush Saga, or something like it. To be fair, Mattrick didn't specifically single out Candy Crush Saga. Rather, he used the latest earnings conference call to clarify that he wants to see Zynga developing games that "fit the way consumers are playing across various platforms." No platform is growing faster than smartphones and tablets. According to data compiled by AppLift and Newzoo and published last October, the global mobile games market is on track to grow 27.3% annually to $23.9 billion by 2016. A growing installed base, as well as higher average spending per player, is fueling those gains. Some of the new players will come from overseas. Recently, King Digital (UNKNOWN:KING.DL) began offering Candy Crush Saga to Chinese players through a partnership with local publisher Tencent Holdings, whose QQ and WeChat messaging services cater to hundreds of millions of users. We don't yet know how big a boost King might get from tapping China's digital sweet tooth. Nevertheless, you can bet that Mattrick is watching how the story unfolds, especially as Zynga's latest mobile-first efforts take hold. In April, Zynga introduced FarmVille 2: Country Escape to a largely positive reviews. "Zynga developers set out to build a better FarmVille game for mobile devices. They may have built the best FarmVille game of the series," wrote Kotaku's Mike Fahey at the time. Today, the game gets 4.2 out of five stars as determined by over 662,000 votes from Google's Play users. At the iTunes Store, the game rates four of five stars over 54,000-plus votes and is the 34th-highest grossing iPhone app and the 20th-highest grossing iPad app. Good numbers, to be sure, but nothing like what King is producing with Candy Crush Saga -- the second-highest grossing game on the iPhone and the iPad, trailing only Supercell's Clash of Clans. If FarmVille 2: Country Escape is the present, the future includes a lot more mobile games built around recognizable brands. Early wins include deals with the National Football League, Tiger Woods, and Time Warner for the Looney Tunes brand. Sports games will live under the brand Zynga Sports 365. Golf games using Woods' name won't debut before 2015. A Looney Tunes game is slated for the holiday season, though details remain elusive. But with the NFL season right the around the corner, Zynga's first major mobile catalyst could be about to launch. "Starting with football, today [Aug. 7] we're announcing two multi-year licensing partnerships," Mattrick said during the latest earnings call, "one with the National Football League and another with the NFL Players. These licenses will enable us to bring real NFL teams and athletes, including their names and license, to our players, creating an authentic football team manager experience that can be enjoyed anytime, anywhere." NFL Showdown will arrive on mobile devices as the new football season gets under way. Credit: Zynga, via the Google Play Store. Can any of this work? My Foolish colleague Leo Sun is concerned about licensing fees, and rightly so. Games designed to collect just a few dollars at a time -- as NFL Showdown is -- could have trouble earning enough to pay overhead. Zynga doesn't need a top-10 game that fails to deliver profits. Then again, any fair evaluation of Mattrick's record suggests he's not the sort of executive you bet against. In his last gig at Microsoft, he helped turn around the Xbox business. Whether Zynga today is in worse shape than Mr. Softy's Interactive division was in 2007, when Mattrick joined, is a matter of debate. All we know for sure is that Zynga needed drastic action, and spending big on licensed brands during a time of steep losses is as drastic as it gets.